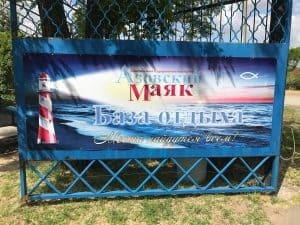 On Tuesday, June 13, we headed the Azov Sea to a Christian campground. The Azov Lighthouse camp is 760 kilometers from our home. Obviously, it was a full day of driving! Chris, Mary, Micah, Eliana, June, and some guests who came for the camp (James and Trudi) punched in the coordinates on the GPS and hit the road. We prayed a lot and depended on the Lord. A van full of Americans on a ten-hour trip. 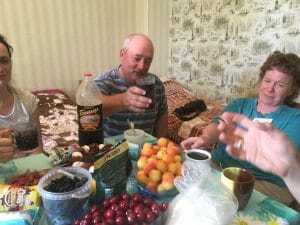 Our original plan was to travel with Yuri and Sveta (our friends and neighbors – Yuri was pulling a trailer with all of our supplies for the camp), but they had an issue with their car that put them about six hours behind us. While we were still over 200 kilometers from the war zone, we were a lot closer to it than we are at home – so we were a little nervous about it. We didn’t think we would be in danger, but if we were stopped, communicating in Russian can be challenging in moments like that. About halfway there, we began to hear a noise coming from the front, driver’s wheel. We stopped and inspected it but didn’t see anything out of the ordinary. However, after another block, it was obvious that we couldn’t continue and out in the middle of nowhere, we looked up and there was a tire repair shop. We prayed that God would give us someone to help us that would not try to take advantage of us. We got the van up on the lift and as soon as the wheels left the ground, that wheel nearly fell off the an. It was being held by only one lug nut. The repairman looked up at me and said, “This is a miracle. God has been protecting you.” He was correct! When I saw the wheel and realized what would have happened had it come off, my heart was flooded with gratitude to God. (Just before the noise started to get bad, I had breathed a prayer asking God to protect us and to protect the van. I literally said, “Amen,” and the noise started to get so much worse and we stopped. I’m a little ashamed to admit that I said another prayer at the moment and said, “I just asked You to protect us and the van, and this is Your answer?”) We had had some work done on the front tires a few weeks prior and he said they may not have tightened them completely and after hitting a couple of pretty significant potholes along the road, they had worked themselves loose. When the mechanic started to get in the van to back it out of the bay for me, he popped his head out and said, “A van full of Americans?” And we all had a big laugh. I bet he had plenty to talk about at the dinner table that night! As we exited back out onto the road he and his helper came out to the road to wave goodbye. We immediately prayed and thanked God for his protection and His provision. And yes, I did a little repenting for my sour attitude with my Father. After all, He had immediately answered my prayer of protection. It was just not answered in the way I was asking. Sometimes He answers in ways that we don’t expect and if we aren’t careful, we miss the answer and we think He either hasn’t heard, hasn’t answered, or answered incorrectly. The rest of the trip was uneventful and we arrived about 10:30 that night. Yuri and Sveta arrived around 2:00 a.m.
We spent all of Wednesday setting up and getting things organized in preparation for welcoming the campers on Thursday morning. Trudi is a clown. No, I don’t mean that she’s very funny (although she has a fabulous sense of humor). 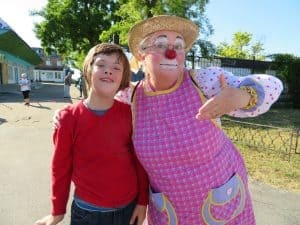 She brought her clown gear and the kids (and parents) were really happy to be welcomed by someone so happy. It was really fun to be there to welcome the from their overnight trip on the train. There were around 160 people who came from Brovary. This was 45-50 families. The group was made up of special needs families and other families from Grace Church in Brovary. 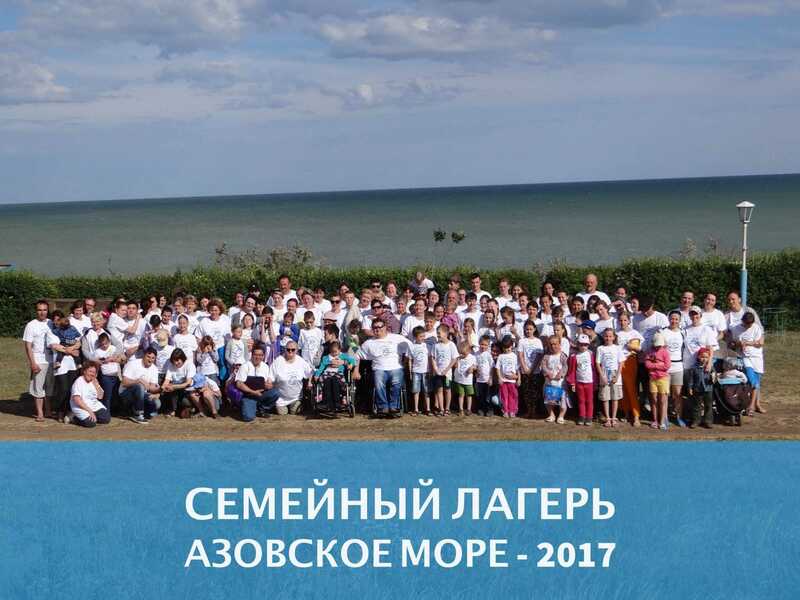 Many of these families have been part of the Special Needs Camp at Voronkov that we have participated in for years. Families can only attend that camp three times, though, and then they can attend the all-church family camp. About half of the attenders are not yet believers. Our theme for the week-long camp was “Purpose Driven Life.” Rick Warren’s book has been translated into many languages and we have used the Russian version extensively here in our ministry and in the ministry at Grace Church. The main theme question was, “Why am I here?” And then each day we answered that question. (We were created for God’s pleasure. We were created to be part of God’s family. We were created to become like Christ Jesus. We were created to serve. We were created to be on mission.) Each day we had a morning devotion time where we prayed together and had a brief devotion to introduce the theme for the day. Then, before lunch we had a “service” with music and a longer message that spoke to the them for the day and left some questions unanswered that we talked about in our afternoon small groups. Also, each day, we had a verse that each person was encouraged to memorize. At the end of the week, those who had memorized all the verses got a chocolate bar. Our original plan was to give them a copy of the Purpose Driven Life book, but we decided that we really wanted everyone to get that. So we made the prize a chocolate bar and gave each person a book at the end of the week. MANY memorized all the verses. It was a very fruitful week, in that their awareness of God’s Word was enlarged and many questions were asked. As we began to work on the memory verses, we heard many times that it was very hard to memorize something when you had no idea what it meant. We were asked repeatedly to explain what the verses meant. This is HUGE! Their appetite for truth was whetted and we had the opportunity to not only explain those verses, but to use other parts of God’s Word to explain them. What a tremendous opportunity. We had several people who were completely closed off at the beginning of our days together. In fact, we wondered why some of them had even come to the camp knowing that it was a Christian camp and that we would be talking about God the whole time. But God has HIS plans and we saw the hardness began to soften and even melt away in several cases. We were told by more than one that they had no interest in these topics when they came but that they now want to know more. We have a lot of follow-up that we are doing from the camp at the sea. I (Chris) celebrated my 47th birthday at the sea. Mary and my friends made me feel very special and threw small party for me on my birthday afternoon. Also, the following day, James and Trudi, along with Pastor Boris, his wife, Sveta, June, and Mary had another small celebration and this was also a great opportunity for James and Trudi to get to know Boris and Sveta. Both events were great times. As we sat around the table with Yuri, Sveta, June, Alona, and Mary and ate fruit, ice cream, and cake and drank knock-off coca-cola, I was so thankful that we are here and that we have such close relationships so far away from our “home.” We laughed a lot. We told stories from our childhoods and even told a few jokes. All of this is happening in Russian and I was so thankful to God that He has allowed us to communicate and to understand. It’s a priceless treasure and we are very grateful to our Father for it. There were some dads there of children with special needs that we have NEVER seen. We have gotten to know their wives, but these dads have never been t anything. Ever. The first part of the camp we never really saw them at anything, but by halfway through the week, they were participating and connecting with us. There was one mom, in particular, that we have had interaction with before that has been very closed. She has been part of support ministries, but closed the the Lord, the Bible, and the church. This week at camp, we saw some of that hardness fall away and a new openness take it’s place. She even said that she was going to begin coming to church. James and Trudi Sang have a grown son with a special need. They were such a great encouragement to the families at camp because they have much more life experience and they have entered into their son’s adulthood. They have not only survived, but they have learned to thrive. They were so open and willing to share their lives and it s so important for our camp this year. They hope to return to Ukraine soon. How can you pray for those at the Azov Camp? Pray for the dads that were there and that we will have further opportunity to build relationships with them and share the Gospel. Pray for the moms who opened up to us for the first time. We hope to get them to Friday night Bible study in September when it starts. Pray for the families who have typically developing children who were at the camp and that they will continue to build relationships with the families with children with special needs. It’s important to live life together with these families. We hope to be part of the family camp next year, as well. If God wills it. Enjoy the pictures below from the Azov Sea Family Camp.